The Case-Shiller Index report for May 2014 for the 5-county San Francisco Metro Statistical Area was released yesterday, showing another small bump in home prices from April to May. The aggregate or total index is now up approximately 55% since the market recovery began in early 2012. The 5 counties covered by the index are San Francisco, Marin, San Mateo, Alameda and Contra Costa. 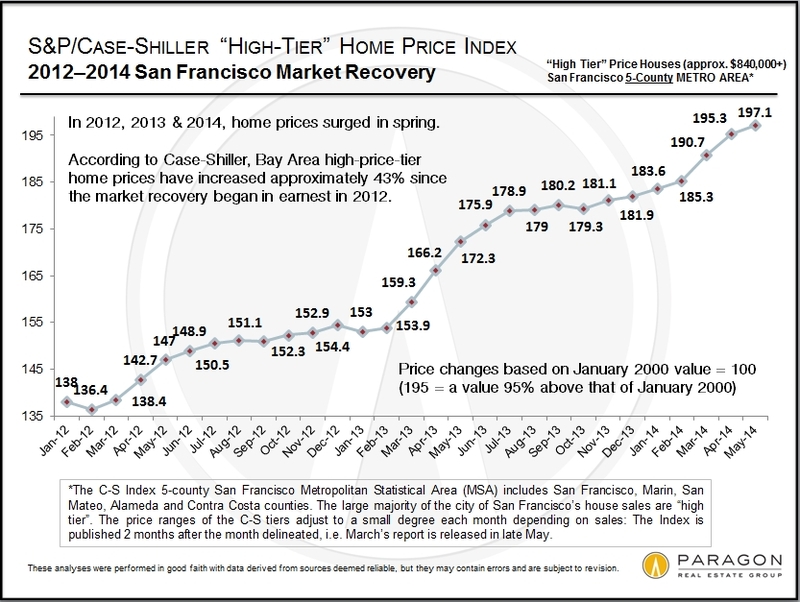 Our full report can be found here: http://www.paragon-re.com/Case_Shiller_Reflects_Accelerating_Home_Prices. However, Case-Shiller also breaks out home price changes by price tier – low, middle and high – and each tier has experienced dramatically different trend lines since 2000. The low price tier – homes found mostly in Alameda and Contra Costa counties (though also other Bay Area counties not in the SF MSA, such as Solano, Sonoma and Napa) experienced a crazy bubble much larger than the other price tiers and subsequently experienced a much bigger crash due to foreclosures and short sales. 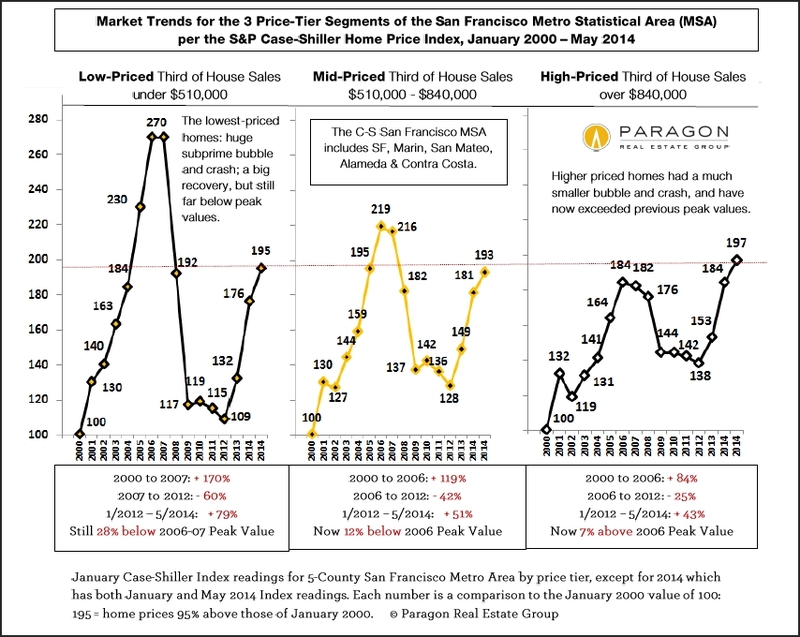 The middle and high price tiers, which predominate in San Francisco, Marin and San Mateo, experienced much smaller bubbles and crashes. This is dramatically illustrated in the first graph below. In all the Case-Shiller Indices the numbers refer to a January 2000 home value of 100. Thus a reading of 195 signifies a value 95% above that of January 2000. All tiers have seen big recoveries since 2012 began, but only the high-price tier has now exceeded previous peak values attained in 2006-2007. Because of the absurd size of the low-price tier bubble, its home prices are still far below previous peak values and it’s probably unreasonable to expect them to be surpassed anytime soon. However, all the price tiers show very similar overall appreciation rates since 2000, running from 93% to 97% over the 14 ½ years, which suggest an equilibrium is being achieved across the general market. This chart below tracks home price appreciation for higher-priced homes since 2012. As with all statistics, monthly statistics are much less meaningful than longer term trends. 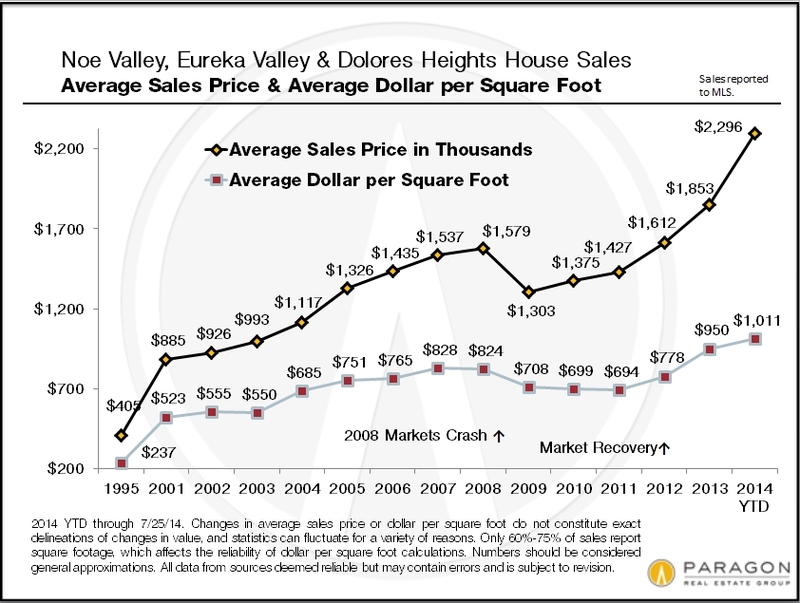 San Francisco itself, whose median house price is now over $1.1 million, has performed significantly better than even the general high-price tier, as can be seen in the median price chart for the Noe & Eureka Valleys neighborhoods of the city. This chart is just a sample of how some San Francisco neighborhoods – especially its most expensive ones – have far exceeded general Bay Area appreciation trends, as far a previous peak values are concerned. Many of San Mateo’s cities have experienced a similar dynamic, as they both share the dominant effect of the high-tech wealth effect on home prices.